One major gain during the pilot phase of the CFLN is timely data entry. We currently have no measure to assess quality data. However, the new FIEx measure for the percent of FIEx events with a pulmonary exacerbation assessment marked as “absent” (marked as absent) may be a proxy for quality data entry. The graph on the left is the “marked as absent” measure for the cohort 2016 teams. The red line is the time stamp at which these teams joined the CFLN. These cohort 1 teams had a steady decline in “marked as absent” prior to their enrollment in the CFLN. Taking into account that the last month’s measure is not usually valid as there are missing encounters, the graph may indicate a more rapid decline in this measure after the cohort 2016 teams joined the CFLN. The cohort 2017 teams have a decline in the “marked as absent” measure which began during their recruitment phase. The graphs inspire the question, “does enrollment in the CFLN improve not only timely data entry but also quality data entry”? 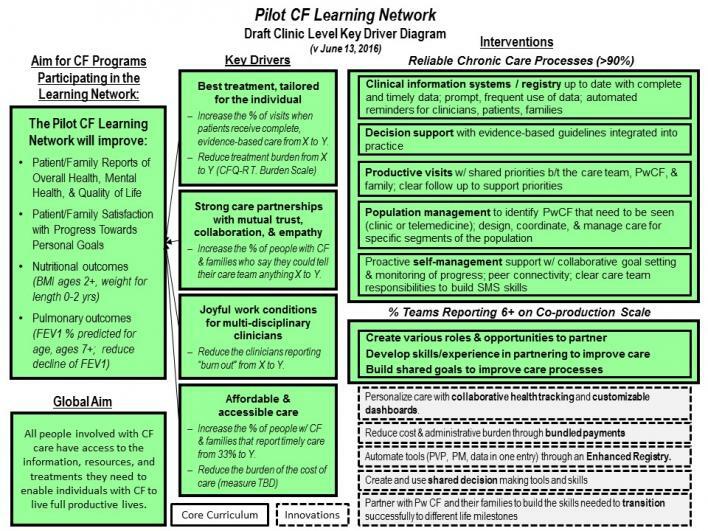 The CFLN Patient and Family Partner Program’s goal is to learn what makes a Patient and Family Partner (PFP) and QI Care Team co-produce most successfully, to improve that co-production on a variety of levels and to support PFPs as they navigate this new working relationship with their clinical teams. On a regular basis, approximately 36% of PFPs responded to our monthly surveys that tell us about the Patient and Family Partner experience within the CFLN. As of August, 25% PFPs report that they are leading or co-leading a QI initiative. Seventy-five percent of PFPs who responded to our survey report that they are engaged at a 5 or above in the Ladder of Engagement. In August 2018, 63% of PFPs who responded to the survey state they are highly satisfied in the working relationship with their CF Care Team. Seventy-five percent of PFPs that reported feeling they’re a valued member of their CF Care Team. Seventy-five percent of PFPs that report feeling they are a valued member of the Network. And 88% PFP that reported feeling they’re a valued member of their care team in managing their/their child/partner’s health. This Fall, 7 Patient and Family Partners submitted a proposal to lead or co-lead for this year's CFLN Fall Community Conference. One third of all Fall CFLN Community Conference proposals included a Patient or Family Partner as a lead or co-lead. 2018 in the poster called "PATIENT AND FAMILY PARTNERS: COPRODUCING QI IN THE CF LEARNING NETWORK". At this Fall's Community Conference, Breck Gamel will co-present alongside several Patient and Family Partners a session called, "Building and Sustaining Organizational Infrastructure for Patient and Family Partnership." At the 2018 Spring Community Conference Kris Petren unveiled new analyses and measures related to Pulmonary Exacerbations. A measures subgroup has worked to define a baseline lung function value and used it to identify FEV1 Indicated Exacerbation (FIEx) events. Using these events to identify exacerbations - as opposed to using IV treatment as the definition - allows us to analyze: 1) the frequency of these events (less events is better), 2) if and what type of treatment may have occurred after the event, and 3) what was selected for the Exacerbation Assessment during the event. These measures are now available to the network teams on CFSmartReports and future updates will be announced on upcoming monthly network webinars. All CFLN Registry Reports will now be shared solely through CFSmartReports.com. The data will be refreshed weekly on Mondays. This will allow an opportunity for LN members to have access to their reports whenever they would like to review them, rather than waiting for the reports to be sent to them via e-mail from the LN Staff. This change in reporting also alleviates the manual process of updating and discriminating the reports. The Community Innovators Team has been quite busy lately with building Awareness of the Team. As a team of patients, parents and other stakeholders, we have been working to provide opportunity for new members to learn about who we are, what we do, and how we do it. Primarily, the Community Innovators Team consists of passionate individuals who want to use their expertise and experience to better the lives of those living with cystic fibrosis. We are taking that passion and harnessing it into QI projects that are testing out the efficacy, and efficiency of new ideas. Began creating a clear, documented Onboarding Process for new CI members. Overall, the excitement of the Community Innovators is growing and gaining momentum. This means that we have more patients and families in the Network that are being trained in QI work for future projects. What does this mean for the CFLN? Awareness is growing, participation is increasing, and our goal of improving the lives of those living with CF is feeling closer with each new member joining. We look forward to being able to report an even greater increase in participation in QI projects, with changes being made in the CF Care Model as a result, in our next newsletter! We congratulated the CFLN teams! In November we reached our highest percent of teams completing at least one PDSA cycle. Testing and PDSAs are foundational for learning and improvement and coming out of the Community Conference and NACFC, it is truly spectacular that almost all of our teams were able to test at least one idea. Especially remarkable is that all of our new Cohort 2017 member programs have really hit the ground running and have all completed at least one test in November. The average number of tests per team in November across the network was just over 3 – it’s clear you all approaching PDSAs the right way – small and rapid cycles. Huge kudos and keep up the fantastic work. CF directors from 285 CF programs (pediatric, adult and affiliate programs) were asked to enroll in the national deployment of the CF Patient and Family Experience of Care Survey (PFEC) survey so they could receive feedback from people with CF and their families. Since 2015, 156 programs deployed PFEC with a total of 9,530 completed surveys from 6,793 people! So why are there more surveys than people? The data collection is continuous in which people with CF visiting their CF center receive a survey invitation every 6 months. One family has completed 6 surveys over the last 3 years - wow - that is dedication to giving feedback to their CF center. This continuous data collection provides an opportunity to monitor the PFEC measures over time and if experience of care improvement work is implemented then the improvement team can learn whether changes lead to a measurable improvement. For example, we know there has been incredible improvement in infection control practices. Specifically, respondents selecting “Yes definitely” a mask was available at their recent visit has improved from 83% in 2015 to 97% in 2017. Additionally, 10 CF programs improved their result to 100% and 46 CF programs had all respondents reporting a mask was available for their use. Having a mask available is one of the recommendations in the CF Infection Prevention and Control Guideline to prevent the spreads of germs from person to person. Besides PFEC providing a forum for patient and family feedback, it also fulfills a guideline recommendation to monitor adherence to infection and prevention control practices. A big " thank you " to everyone at the CF programs that deployed the PFEC survey and to all the people completing PFEC surveys! The information is being used to improve care as one strategy in leading change is listening to people’s feedback and giving feedback on things that matter to you. Karen Homa leads the national deployment of PFEC as a consultant for the CF Foundation. The CF Learning Network is the first group of users to CFSmartReports.com! This web based application is designed to supplement reporting measures for Care Teams using CFF Patient Registry data. A Patient Summary Report example was displayed at the Spring Community Conference that can be used for pre-visit planning and co-production discussions with the patient/family. We intend to expand on the number and type of reports that will be available through this application in the future including the Clinical Trial Eligibility Tool. The CF Smart Reports portal will help care teams improve their timely data entry in order to learn from our data in a more efficient manner. The scatter plots below depict the upward trend of the last 10 years when comparing BMI (percentile) verses FEV1 scores in our pediatric and adult care centers. The programs involved in the CFLN are highlighted yellow. Our data capturing through the month of June showed that our teams are experiencing a steady increase in ratings on the Co-Production Scale, which those rating greater than five started at 15% in November and is now at 71% in June. This means that our Cohort 2016 teams are involving parents and people with CF in to their work more and more. Additionally, our percentage of programs who have over 75% of planning priorities of patients in their Pre-Visit Planning has increased from zero at the beginning of this year to 14% for April. Many of our teams are working diligently to learn how to perfect the Pre-Visit Planning process and are constantly sharing their findings to learn from one another. Further analysis of our network data leads us to believe that the programs with the highest satisfaction scores tend to be among the highest in contributing and participating in the Patient and Family Experience of Care Survey, the Exchange, and the webinars. 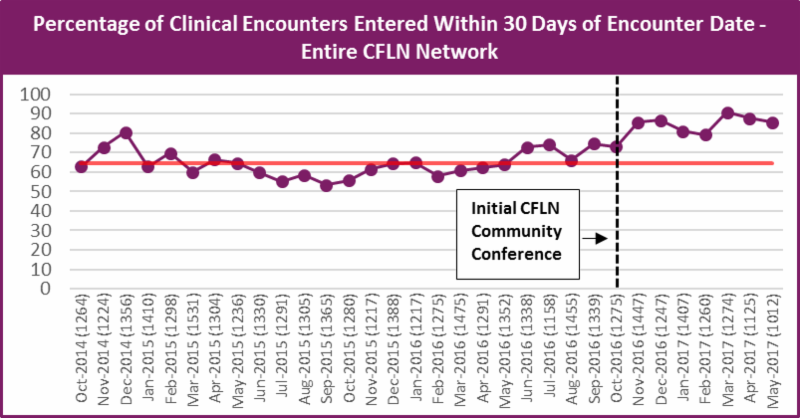 As mentioned in our last newsletter, the Data Timeliness Measure (the number of days it takes for clinic encounters to be entered into the CFF registry) has been the focus of the CF LN. More recent data shows the amazing progress that has been achieved within the community since the initial CF LN Community Conference in October 2016. In the chart below the red line displays the mean percentage during the 24 months prior to this Community Conference. At the Community Conference, the CF LN leadership tasked teams with providing more timely data entry and thus we have seen fantastic improvement in the of data entry measures. All of our teams are proud of this network wide improvement and have been encouraged to continue to keep up this fantastic process as we move forward! As we head into spring the 14 teams will be submitting their Project Planning Forms listing out their next 90 day goals and PDSAs. Teams will continue to concentrate their efforts in the intervention areas of improving and collecting Patient Reported Outcomes (PROs), Pre-Visit Planning (PVP), Co-Production, and Data Timeliness and Quality. Of course teams are also welcome to examine other areas represented in the CFLN KDD (i.e. Joy in Work, Population Management, etc.). Data timeliness has been a focus of the CFLN in effort to produce a real-time registry within Port CF. This would allow clinical decisions to be made with relevant, real-time data. A few of the CFLN programs have been recognized for their progress in the monthly CFLN Highlights Reports, circulated since November 2016. One of which was Doernbecher Children’s Hospital due to their efforts in using the CFLN Reports to examine their data timeliness. The data showed that they had slowdowns during certain parts of the year and as a team they were able to drill down and identify why these were occurring. This resulted in a new process flow diagram which they generously shared on the Exchange, for the other programs to steal shamelessly. Another program highlighted was Seattle Children’s Hospital, which had been entering data on a bi-monthly or quarterly basis. Their number of encounters that occurred each month remained relatively stable but the number entered each month varied greatly. However, after joining the CFLN for a few months they started entering more encounters than usual. Thus, leading to an above average percent entered within 30 days and a below average number of days between encounter and created date. University of Cincinnati, an adult CF program, was also recognized for their improvement work in this area. They demonstrated how even those programs already successful at timely data entry still have an opportunity to improve upon their achievements. After viewing their data they recognized their data dropped off when their sole staff member responsible for this undertaking went on maternity leave. This brought to light the need for a standardized data entry process, so that any staff member could complete timely and accurate data entry when necessary. Currently their team is testing and running PDSAs to tackle this obstacle.